As I told sarah earlier today, I spent this afternoon trying to write something, a very nebulous idea that is taking its time to unfurl out of my sluggish brain. The idea is going somewhere, but very much at its own pace. It will not be forced, only coaxed, and I am a little afraid that at the end of it, it will be a very bad piece of writing despite all this hard work. Oh well, you never know till you try. In other news, for a weekday there were a surprising number of people flying their kites at the Marina Barrage this evening, and quite a few of them were teenagers. 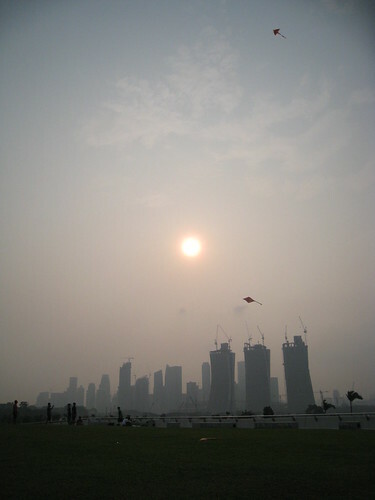 As the haze settled over the city, it was all so very surreal.